Recorded in the spellings of Walton and Wolton, this surname is of Olde English pre 7th Century habitational origins. 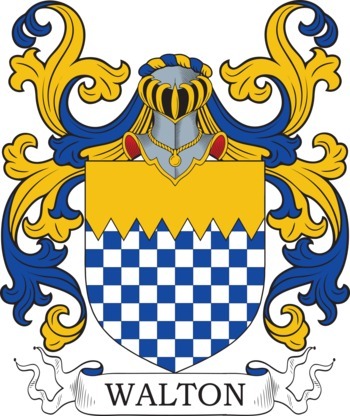 It derives from either one of the various parishes called Walton, or from a "lost" medieval village somewhere in the south east of the country and called "Wolton", or from a topographical site with the suffix "tun" meaning a farm or hamlet plus one of the prefixes "wald" (a wood), or "walh", a farm worker or "walesc" - a foreigner. The latter is most interesting as it probably refers to somebody from the next village, although it could also mean a Saxon, Viking or even a Norman. Leave a message for WALTON family members. Invite more WALTON family members! Click 'Invite' to connect with more members of the WALTON tribe.